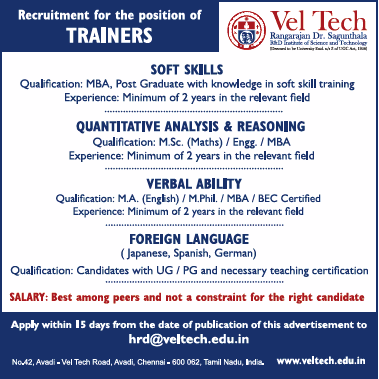 Vel Tech Dr.Rangarajan Dr.Sakunthala R & D Institute of Science and Technology, avadi, Chennai has advertised in THE TIMES OF INDIA newspaper for recruitment of Trainers jobs vacancies. Interested and eligible job aspirants are requested to apply within 15 days 19th Sept 2018. Check out further more details below. About College : Vel Tech offers UG, PG and Ph.D. programmes in both Engineering and management. The Institution has made distinctive progress since the founding in 1997, by adopting the unique and trending educational methodologies. Vel Tech is the first member from India to be part of CDIO, an innovative educational framework for producing the next generation of engineers. How to Apply: Interested and eligible candidates are requested to CV along with all copies of certificates / testimonials and recent PP size photos to the email address provided here.